Today was the first official day of Spring and the weather couldn't have been more perfect. Its still a bit chilly but the sun was shining and the sky was perfectly blue. I dressed up for the occasion and took my old bike out of the shed for the first time since last fall. Its incredibly difficult to ride in these shoes so I won't be attempting that again, but that didn't stop me from going a little picture crazy. This vintage dress has been mine for almost 3 years, but I hardly ever wore it because it was so long. Over the winter I shortened it and like a butterfly coming out of its cocoon it was ready to fly out of the closet. Hopefully now it will have the chance to be on heavy rotation in the coming months. 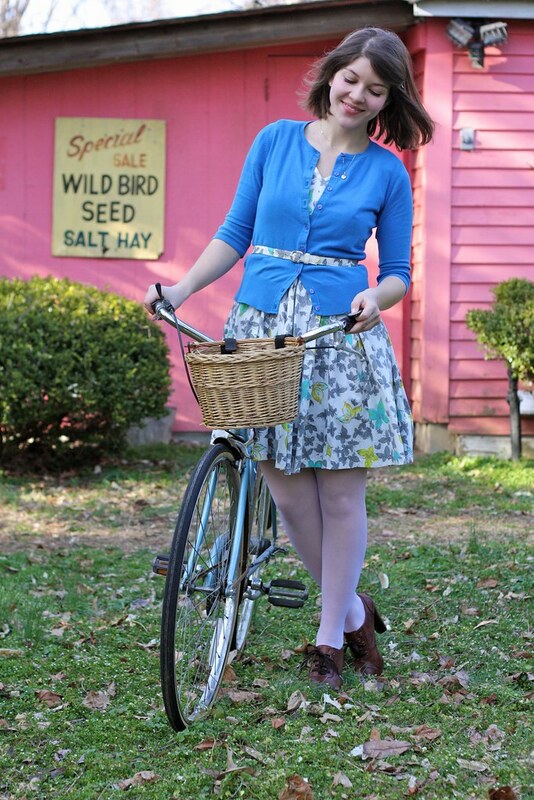 I think I just died a little..
Blue dress, oxford shoes, bike with basket..
Super cute. 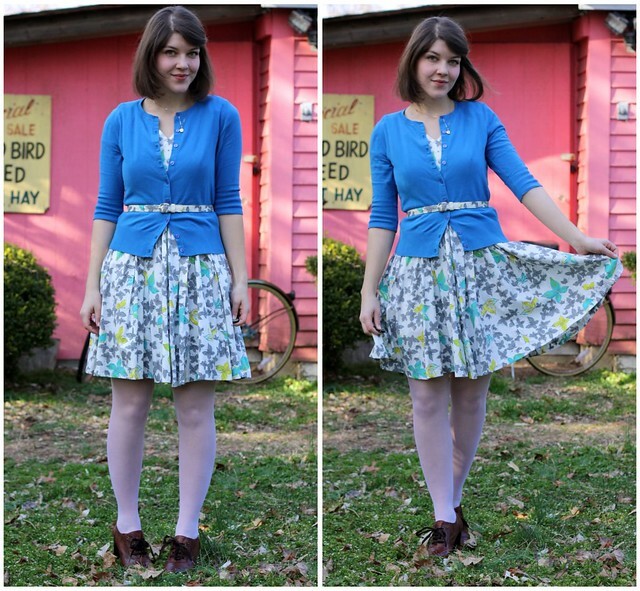 Love the dress, love the belt, love the bright blue cardi. I nominate you for Official Spring Sprite! your sweater is beautiful you got such a great style!! I'm following your blog hope you can follow mine too! adorable dress. looks fantastic with that bright blue sweater! very refreshing. also love the shoes. you look great! that dress is so pretty and swishy!! The print on that dress is so lovely! 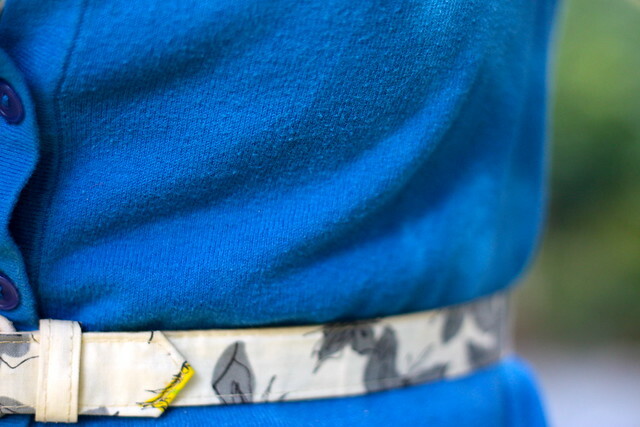 And the matching belt! Did you make that or did it come with the dress? Ah, these pictures are gorgeous. 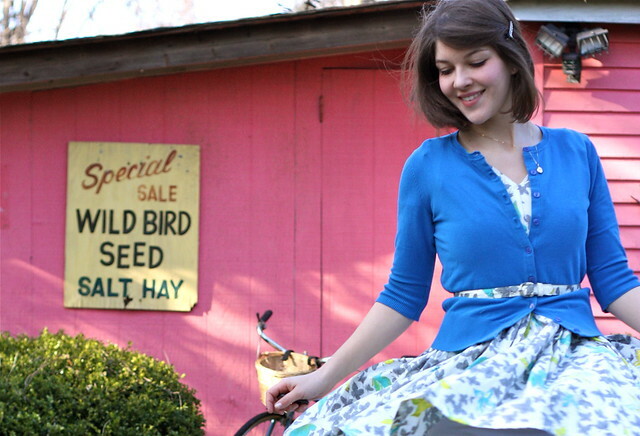 And a butterfly print vintage dress... so great! Don't you just love finding great vintage items? This print is so beautiful! What a lovely dress too. that dress is so pretty and springlike! i'm delighted that it found its way out of the closet-cocoon :) i am also in love with that bright cobalt blue for spring/summer. i need to find a cardigan in that color! happy spring (it's still snowing here...)! that fabric is amazing! so glad it's going to come out of the closet more. happy spring!!!!!!!!!!!!! thanks goodness it's finally here! What a perfect start of spring look! I'm so glad spring arrived! Today was such a sunny day in London that feels so good. that picture of you with the bike is perfect and so amazing!!!!!!!!!!!!! beautiful!! this outfit is so graceful and sweet. Yey for spring. What an uh-may-zing dress! 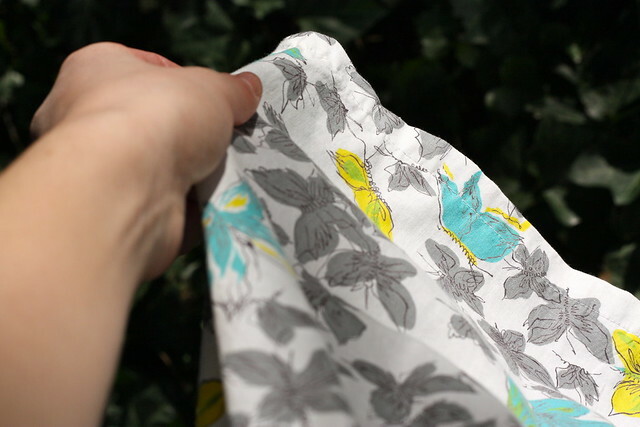 The butterflies print is just so darling. it's crazy how much a few inches off of a hemline can change the look of a dress. I had these two gorgeous dresses that I simply never wore, but when I finally got around to shortening them, Bam! go-to summer staples. Gorgeous bright colors. It is a real gem of a dress when it still has the matching belt! Happy Spring! Oh, I LOVE the bright blue! It looks so pretty on you. This is definitely perfect for the occasion...hope you had a great first day of spring! 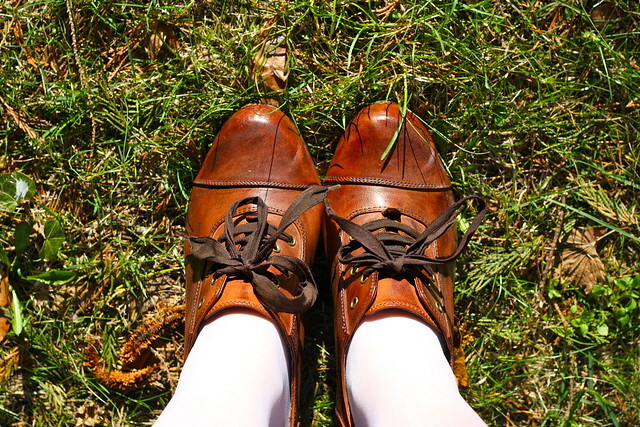 Wahhhh LOVElovelove those oxfords! Can't believe JC makes something quite tame but still super stylish nonetheless. Totally works for this otherwise super feminine ensemble- Love it! Thanks for sharing! EEE! 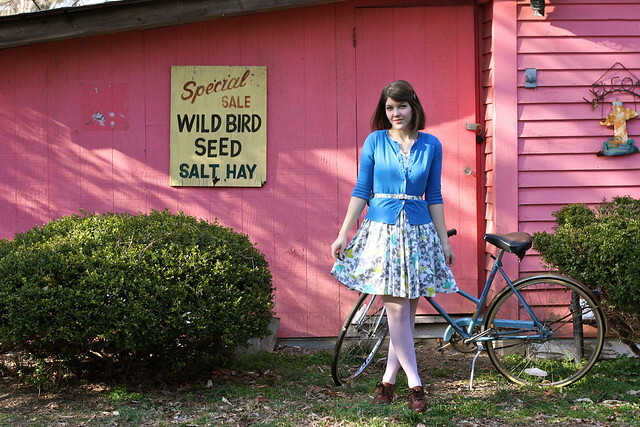 I want your bike and your dress and everything ;) you look so great in blue and I love the photo with you and your bike. You are the definition of spring cuteness! So pretty and spring like! Aren't those BP cardigans the best? I have a whole bunch. I don't have that color blue though and wish I did! I love those shoes! Curse you, Jeffery Campbell, for being so freakin' expensive and so desired at the same time!